Read more on the latest news, facts and figures on Rhino Poaching and Rhino conservation both globally and in South Africa and Kruger National Park. 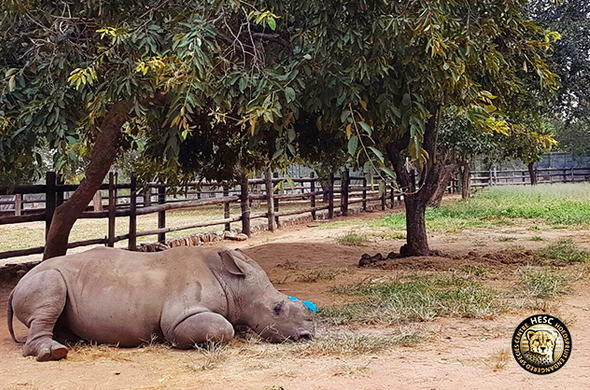 In yet another desperate attempt to save the rhino, some conservancies including the Hoedspruit Endangered Species Centre, have dehorned their orphaned baby rhinos. Poachers believe that the keratin-filled horns possess healing properties, which is NOT the case, and will stop at nothing to dehorn these creatures. For some time now, park managers have considered taking matters into their own hands by dehorning orphaned rhinos. Many park managers believe that this will save the rhino specie from becoming extinct, because poachers will then have no reason to kill them. Members of the public are concerned whether or not orphaned rhino will endure trauma and pain during the dehorning process, and if the horn will eventually grow back. The standard procedure to legally dehorn orphaned rhino requires a dehorning permit, a veterinary team and nature conservation officials. The procedure then invloves darting the orphaned rhino, attaching it to an oxygen machine and monitoring its vital organs. To avoid damage to their nerves and sinuses, a line is drawn where the horn is to be cut. A chainsaw is then used to make a precise cut along the drawn line. The rough edges are then smoothed out with a grinder, ensuring that the dehorned rhino will not injure one another. As of March 2017, a proposal for the domestic trade of rhino horns has evoked mixed emotions among private rhino owners and those against rhino poaching. South Africa plans to allow the domestic trade and limited export of rhino horns. Once implemented, draft regulations will allow foreigners in possession of permits to export for personal purposes to a maximum of 2 rhino horns. Critics believe that the exported horns would be extremely difficult to monitor and the horns will eventually end up on the commercial markets, which goes against the global agreement to protect the endangered rhino populations. According to minister Edna Molewa, rhino poaching in 2016 has declined while the poaching of elephant has increased. Between January and late August, a total of 458 carcasses of rhino were discovered in Kruger National Park in comparison to the 557 that were found during the same period in the previous year. However, the national total of poached rhino in the year 2016 is 702 compared to the 796 that were poached during January to July 2015. Although the national number of rhino poaching has declined, in areas such as KwaZulu-Natal, Free State and the Northern Cape rhino poaching activities increased. "We are pleased to announce yet again, as we did in January and May, that poaching is on the decline in the Kruger National Park – the area hardest hit," Molewa said. A total number of 414 arrests of alleged poachers have been made in the country since January 2016. Among the arrests, 177 were made in Kruger and 237 in South Africa. A large number of firearms we also confiscated in the park. As of March 2016, 25 arrests have been made in KwaZulu-Natal related to rhino poaching. As rhino become more scarcely, the demand for the rhino horn increases and according to the General Manager of Rhino security in KZN the demand is now at an all-time high. "There's one key thing that drives rhino poaching - that's the demand. If the demand is high, the supply has to be there and the better we get at our jobs. "The demand raises the price. The price of the rhino horn product has risen exponentially and it is very hard to deal with," he said. The past week 6 people have been sentenced who were involved with rhino poaching and are facing a collective of 75 years imprisonment. In July 2014, the carcass of a dehorned white rhino bull that, belonged to SANPARKS, was found on a farm adjacent Mapungubwe Nattional Park. During an autopsy it was discovered that the bull had 2 bullets in its brain. Further investigations led to the buy of the rhino horns in Kwa Mahlanga near Pretoria. During the transaction for the horn, the seller was offered an estimate amount of R80 000 per kilogram for the horns. A sting was set up to arrest those involved. The rangers of South Africa refuse to give up on their ongoing battle against rhino poaching in South Africa and Kruger National Park. Despite the rescue efforts and extra funding, rhino poaching is now at an all time high, leaving conservationists with no choice but to dehorn rhino in order to protect the species. Protecting rhino from poachers has become part of the South African Government's National Development plan, as well as its environmental assets. Four Squirrel helicopters and new night vision equipment are among the latest efforts by the rangers of Kruger National Park to fight the battle against poaching. Poachers are currently winning the battle as rhino poaching increased by 30% in Kruger National Park, as of October 2015, yet the rangers of KNP insists that this battle is still far from over. A number of rhino will be moved to safer locations in private game reserves to protect them from poachers. The rangers of KNP believe that there are 12 - 15 groups of poachers that operate within the park. They hunt in groups of 3 and are armed with hunting rifles and silencers. The recent increase in rhino poaching has resulted in numerous discussions over how to combat this threat to wildlife. Nature conservationists support the theory that the translocation of rhino to safe havens will save the species from poachers, whereas government officials remain skeptical as to whether these operations are worth the time, money and effort. Environmental Affairs Minister, Edna Molewa, voiced possible solutions to the problem of rhino poaching. She said "South Africa is considering a range of rhino strongholds, inclusive of national parks, provincial reserves, communal areas and private reserves" and added that the Department of Environmental Affairs was also looking into the benefits of moving some rhino out of the country. South Africa is currently in talks with neighbouring Botswana and Zambia about possible translocation of rhino to these countries. Sam Ferreira, South African National Parks' large mammal ecologist, said that up to 500 rhino could be removed from the country. Out of the 631 rhinos that had been killed by poachers between January and 6 August 2014, a shocking amount of 408 were killed in the Kruger National Park. Ferreira said that in order to protect these species, they would have to be removed from areas where they are in threat of being poached. An organization called Rhinos Without Borders has emerged following the struggle to save the ever-decreasing rhino populations. The organization aims to raise funds and move 100 South African rhinos to Botswana, where poaching statistics remain relatively low. Initiated by a couple, Dereck and Beverly Joubert, who have worked with National Geographic in Botswana's Okavango Delta, the organization plans to start the translocation process in January 2015. Two tourism companies, Great Plains Conservation and &Beyond (who have recently moved rhino), will assist Rhinos Without Borders in this conservation attempt. The idea of moving these endangered species to safe havens is one that seems plausible and along with the growth and improvement of Botswana's Defense Force, should prove to be a successful operation. However, along with these strategic plans comes an inevitable list of challenges. Financial funding is the major obstacle standing in the way of the implementation of the translocation project. Transporting one rhino from South Africa will cost about $45,000. The removed rhinos will be donated to the Botswana government, creating an additional loss for South Africa. Despite this, moving the rhino to the neighbouring country seems like a much smaller risk than leaving these grey giants exposed to the brutality of poachers. Along with fund-raising, safety is another major concern. The placement of the rhinos needs to be carefully and secretively carried out to avoid attacks by poachers. The 100 rhino that are to be moved will be moved at different times and to different places to ensure that Botswana's Defense Force can cope with the newfound pressure being placed upon them. In May 2014, South Africa had signed a cross-border hot pursuit agreement with Mozambique, granting each country the right to follow through in an attempt to capture suspected perpetrators. According to national police commissioner, Riah Phiyega, South African Police Service units have already started pursuing rhino poachers from the Kruger national park into Mozambique. The Kruger National Park's eastern border is currently the most threatened part of the park and shares a border with South Africa's neighbouring country, Mozambique. A fence is soon to be erected in an attempt to keep poachers from entering the park. The battle between rangers and poachers is an ongoing one. Despite the involvement of the police, game rangers are often the first to come across these intruders and confront these well-armed poachers. The results of these encounters are often fatal - at the disadvantage of the game reserves and the war against rhino poaching. The early twentieth century saw the existence of a global population of approximately 500 000 rhino, in Africa and Asia. The use of rhino horns is becoming increasingly popular, pushing the species closer to extinction. At present, a diluted amount of approximately 29 000 rhino are alive worldwide. A dueling battle between poachers and conservationists represents the contrasts between the quest for economic gain and the struggle to maintain an untainted wilderness. Various topics centred on the illegal poaching of rhinos have come up since the activity has become popular. Organizations opposing the act of slaughtering rhinos to use their horns in illegal horn trading have suggested that the trade be legalized so that it can be regulated. In June 2014, Environment Affairs Minister, Edna Molewa, opened up a platform through which a panel of 10 experts can investigate the pros and cons of legalizing the trade in South Africa. Their report is expected to be submitted by the end of 2014, when the government will review the suggestions and take it into account during policy-making considerations. Despite efforts to reduce rhino poaching, 2011 saw the declaration of extinction of the Western Black Rhino. The International Union for Conservation of Nature (IUCN) has confirmed that the cause for extinction was poaching, putting more pressure on conservationists and nature lovers to act before further damage is done to the remaining species. In July 2014, the Department of Environmental Affairs announced that a total of 558 rhino had been killed since January 2014. The Kruger National Park is the most prominent target for poachers, with a total of 351 rhinos poached in the famous South African park. There are five species of rhino, residing mainly in Africa and Asia. These include Africa's White Rhino and Black Rhino, and Asia's Greater One-horned Rhino, Sumatran Rhino and the extremely vulnerable Javan Rhino. The White Rhino, with its mass of between 1 800 - 3 000kg, exists in the southern African countries of South Africa, Botswana, Zimbabwe, Namibia, Swaziland, Zambia and East Africa's Kenya and Uganda. Nicknamed the square-lipped rhino, this species uses its flat, square lip to graze the tropical and subtropical grasslands, savannas and shrub lands. Recovering from the threat of extinction, the species has grown from having a mere 50 species left in the wild to a total global population of 20 405 White Rhino, rendering this species to the group of near threatened mammals. The critically endangered Black Rhino, or hook-lipped rhino, exists in a total population size of 5 055 individuals spread out in the southern and East African countries of Kenya, Namibia, South Africa, Swaziland, Tanzania, Zimbabwe, Zambia, Botswana and Malawi. More aggressive than the White Rhino, the Black Rhino becomes more active during the night. Global efforts are being made to spread awareness on this illegal trade and to put an end to the brutal killing of the hunted species. Save the Rhino International is an organization that aims to raise awareness and support for the fight against rhino poaching in Africa and Asia. Conservation activities funded by the initiative expand over various fields. Methods of prevention and cure of rhino poaching include training rangers in filed protection, monitoring and tracking rhinos, environmental education, attempts to reduce the demand for rhino horns, community conservation and gaining local support, translocation of rhinos to safe havens, capacity building and captive breeding as a final resort to protecting and supporting reproduction. In an attempt to raise global awareness and prompt support of the anti-poaching campaigns, celebrities have been voicing their opinions on the topic and uniting to reduce the occurrence of the act. Household names like Prince William, David Beckham and retired basketball player, Yao Ming, have united in the fight against rhino poaching. In collaboration with WildAid, the well-known public figures have created a series of public service announcements in which they urged people not to participate or support the illegal trade.